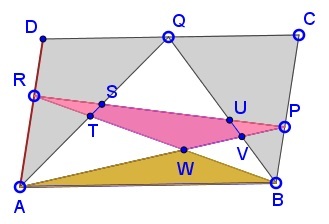 Points P, Q, R slide on the sides of parallelogram ABCD. Prove that, regardless of their position, the difference between the red areas and the blue area is constant. This is problem #53 from Which Way Did the Bicycle Go? where the problem is solved without mentioning The Carpets Theorem. The latter, however, is obviously relevant here and makes the proof more transparent. Area(RST) + BLUE + Area(PUV) = Area(ABW). RED - Area(RST) - Area(PUV) + Area(ABW) - BLUE = RED.